Hello! It's Saturday and time for another great sketch from The Sweet Stop! This week I combined the Sweet 'n Sassy sets Serene Silhouettes and Peaceful Swans to make a Sympathy card. I think this could also be used as a masculine Birthday card. Be sure to stop by and see what the other Sugar Babies have created, you'll find links to their blogs on my sidebar. Thanks for stopping by and have a great weekend! Beautiful, Janice! These two sets are perfect together! What a serene scene to bring comfort to the recipient! This is so Lovely Miss Janice! I really love the color combo you used and the graceful image too. Simply beautiful!! 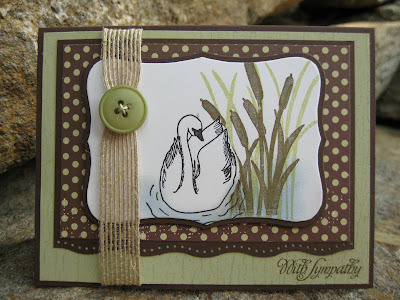 I love the combination of the stamps and and beautiful brown and green. Love this fabulous scene you created! great idea combining the 2 sets. Gorgeous! It's so hot here, that the swan does not even swim in my lake! What a lovely card Janice. The colors are perfect with the pretty images! This is super awesome! Lovin the masculine feel.... spectacular! So calm and graceful. This is so elegant!